Letter: Kalashnikov Suffered Remorse Over Rifle He Invented : The Two-Way The designer of the AK-47, who died last month, reportedly wrote a 2012 letter to the head of the Russian Orthodox Church expressing "spiritual pain" over deaths caused by the weapon. 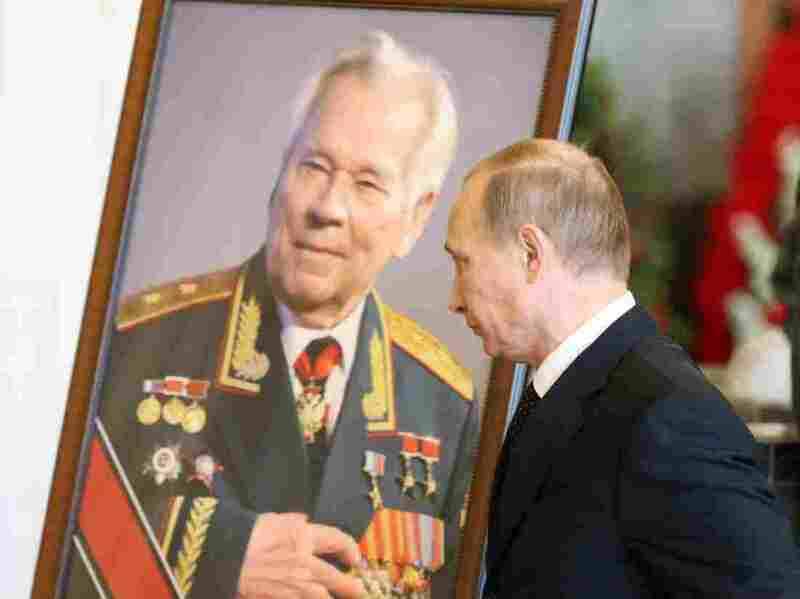 Russian President Vladimir Putin pauses by a portrait of Mikhail Kalashnikov at the arms designer's funeral in December. Mikhail Kalashnikov, the inventor of the AK-47 rifle who died last month at the age of 94, wrote a letter in 2012 to the head of the Russian Orthodox Church expressing "spiritual pain" over the deaths caused by the ubiquitous weapon. More than 100 million AK-47 and variants have been sold worldwide since it was first produced in the Soviet Union in 1949. The Kalashnikov rifle quickly developed a reputation for being cheap to make, reliable and easy to use, making it the weapon of choice for many of the world's infantry soldiers, freedom fighters and terrorists. As we reported in December, when Kalashnikov died, the inventor had hinted publicly at some remorse over the deaths that resulted from the weapon but never said so unequivocally. "My spiritual pain is unbearable. "I keep having the same unsolved question: if my rifle claimed people's lives, then can it be that I... a Christian and an Orthodox believer, was to blame for their deaths? "The longer I live, the more this question drills itself into my brain and the more I wonder why the Lord allowed man to have the devilish desires of envy, greed and aggression." The penitent letter, published in the pro-Kremlin Izvestia newspaper and quoted above in English by the BBC, was typed on the inventor's personal stationery and signed "a slave of God, the designer Mikhail Kalashnikov." Izvestia quotes Kalashnikov's daughter, Elena, as saying that she believes a priest helped her father with the letter. "The press secretary for the Russian Patriarch, Cyril Alexander Volkov, told the paper the religious leader had received Kalashnikov's letter and had written a reply.
" 'The Church has a very definite position: when weapons serve to protect the Fatherland, the Church supports both its creators and the soldiers who use it,' Mr Volkov was quoted as saying.
" 'He designed this rifle to defend his country, not so terrorists could use it in Saudi Arabia.' "
The report of Kalashnikov's letter of remorse comes on the same day RIA Novosti reports that the rifle's manufacturer plans "to sell up to 200,000 hunting and sporting rifles and shotguns in the United States" each year. "The recently established Kalashnikov Concern, which includes Izhmash, Izhmekh and some other small-arms manufacturers under the famed Kalashnikov brand, is expected to sign an exclusive agreement with the Russian Weapon Company at the 2014 SHOT Show in Las Vegas in January. "According to estimates, Kalashnikov could sell up to 200,000 units in the US annually through RWC as an exclusive dealer, the company's spokesperson Yelena Filatova said."